The crystalline structure of Nylon(Polyamide) accounts for its high performing properties. Nylon exhibits exceptional durability, stiffness and thermo stability (temperature resistant from -40 °C to approx. +100 °C) making it an ideal solution for an abrasive, high impact application. The range of different Nylon grades enables its use if a variety of general and specialty applications. 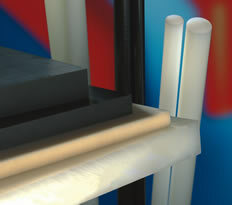 Macplas LTD is able to supply a range of Nylon solutions in sheet and rod form. • Very tough (also in cold condition), high hardness. • Very stress-relieved and high-molecular Nylon 6. Properties are similar to that of Nylon 6. • Nylon 6G Oil has a fine crystalline structure with non wear and tear and is self-lubricating. The high resistance to wear and tear and the remarkable sliding properties can be further improved by adding oil, lubricants and stabilizers. • The polyamide with the highest hardness, rigidity, good resistance to wear and heat deflection temperature. This is best suited for machining on CNC & automatic lathes. • The 30% glass fibre reinforced Nylon 66 has an improved dimensional stability, a very high stiffness and heat resistance that allows further uses.